Why was there a Camaro color called "Hugger Orange?" What is the correct decklid striping for a Z-28 with a spoiler? What is the correct badging for an SS (Z28, Type LT...) Camaro? What is the correct stripe & badge color on 1980 & 81 Z28's? What are the differences between the Rally Sport Nose & Standard Camaro? Note: See the yearly Camaro information under the "Exterior & Interior Color Codes" heading for Specific exterior colors availabile, other exterior options, paint chips, color codes, etc.... for the year camaro you wish to research. A: The answer to the question is YES - hoods from 1970 - 1981 are interchangable. This includes the striker portion of the hood that allows it to clamp shut. I put a 1980 Z28 hood straight onto a 1970 RS Camaro in 5 minutes. However, some minor changes occured over the years. Some hoods are equipped with the Z21 style trim chrome bead. This blends in with the trim on the fenders and down the top of the door. This can be removed or added pretty easily. The way this bead works is it is pressed over the rear lip of the hood. To install it, you press it on and it'll clamp onto the hood. To remove it you CAREFULLY work it off beginning at one edge. You take a blunt wide flat head screw driver and a rubber mallet and work the edge forward off the hood. Tap gently and work the trim off the hood. Have a helper hold the hood as well as try and help pull the trim off the hood while you're tapping. All hoods are flat on the top. The way to identify the typical era of the hood is to look at the underside of the hood. Older hoods have a large round air cleaner impression on them. On newer (78+) hoods you will be able to see where the Z28 scoop stud holes would be punched if the car was a Z28. Obviously, if the car isn't a Z28, the holes won't be punched out, but this is a giveaway in determining the year proximity. The 1978 and 1979 Z28's share the same hood. The hood is different from a standard hood in that it's stamped with an upside down triangular hole that the NON-FUNCTIONAL stinger scoop fits over. This means that the scoop itself will not directly bolt onto the stock hood without cutting out the impression on the hood. Of course, if you are adding the stinger type scoop, you need to locate and drill the holes for the scoop studs. The 1980 and 1981 Z28 scoop was FUNCTIONAL. This hood is punched with 2 oval shaped holes directly over the air cleaner assembly. The 1978/79 hood scoop studs ARE NOT in the same place the 1980/81 scoop studs are. This means a 1980 scoop will not drop directly onto a 1978 hood. Q: Why was there a Camaro color called "Hugger Orange?" A: It started for the 1969 model. 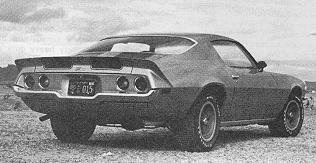 It was the marketing nickname for the '69 Camaro, appearing in magazine ads and commercials. It was in reference to the cars handling characteristics (it hugs corners... so it's the hugger! ), which are needy by today's standards, but for the period it was one of the best handling American cars you could buy. GM advertising used the hugger promotion to offer special color combos with hugger orange paint and an orange and houndstooth interior. Of course the '69 Indy Pace Car had hugger orange stripes. 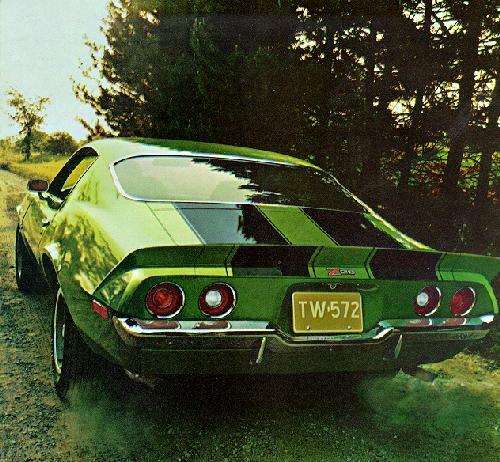 Q: What is the correct decklid striping for a Z-28 with a spoiler? A: There were 2 basic forms for terminating the stripes on the rear decklid. Straight into the edge of the trunklid, or rounded off before the edge of the trunklid or spoiler. An educated guess on my part, and not confirmed, but I'd bet money.... from 1970, and into 1972, the spoiler didn't round off, it ended by going straight off the end of the panel, either the trunklid or the spoiler. Sometime during 1972 or beginning in 1973, the stripes got a rounded off appearance. Example of 1970 - 72 style. Example of 1972 - 73 style.